This is part of a diagram from Alpha Networks OpenCompute Project submission. In a presentation to an OpenCompute working group on February 13, 2017 Alpha Networks said that the SNX-61A0-486T has been submitted to OpenCompute.org. This switch is based on a Broadcom part code named Maverick The part number is BCM56768. Maverick is the name of a company acquired by Broadcom in 1999. There appears to be no relation between the the chip and the acquired company. Note that Broadcom has no information about either BCM56760 or Maverick. There was not a press release for the part, and a published data sheet cannot be found. It was mentioned but not discussed in a slide deck from Edgecore. One way to think about this is that it is a Trident 2+ with gear box integrated into a single ASIC. That this is a downscale part may explain why Broadcom never issued a press release on the part. The Alpha OCP submission paper from which much of this is drawn uses both part numbers (BCM56760 and BCM56768) without an explanation. Comparing Maverick with Tomahawk, the former has 1280 MPPS while the later with more aggregate port capacity has about 4000 MPPS. 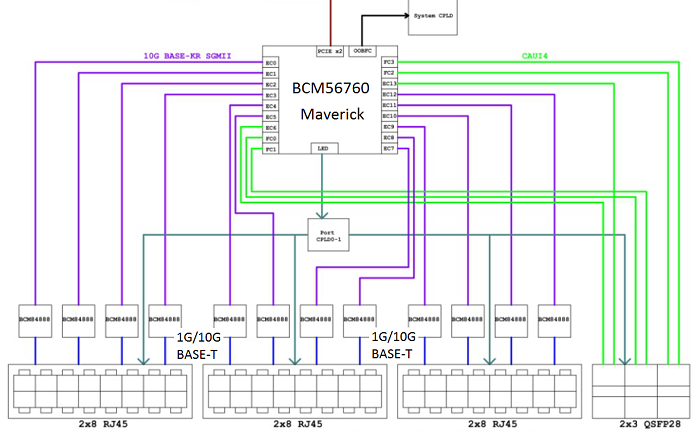 That means Maverick can use a single lookup engine (switch core) for the whole ASIC where Tomahawk needs four. This is consistent with Tolly's finding that the peak burst rate is 8 MB which is more than half the total packet memory and matches the Trident2+.